Another active hurricane season means it’s time for the yearly reminder to be vigilant in avoiding scammers who will promise to repair your home or business but then make off like bandits without doing the promised work. It happens every time after each of these storms, no matter how large the path of destruction. With a long way to go in the Atlantic Hurricane Season – it officially ends November 30 – it bears repeating that these storms always bring price gouging and fly-by-night contractors who excel at taking your money without completing repairs. Door-to-door solicitations should be avoided. Angie’s List says that even though it may be difficult, it is very important for homeowners not to rush decisions about repairs. The complete Angie's List guide for avoiding such scams is right here . The Better Business Bureau has a similar list here  that’s been updated for the 2018 hurricane season. Meantime, the Roofing Contractors Association of Texas announced in recent weeks the group is launching a "Safe Roofs Over Texas" campaign to "raise awareness among home and business owners about roofing scams that take place after bad storms and how they can protect themselves against fraud." "Currently, Texas does not require individuals to acquire a license before providing roofing services to customers, putting property owners at greater risk of losing thousands of dollars to roofing scams," the group said in their announcement. "The lack of basic oversight and regulation by the state opens the door for fraudulent roofers to easily move through recently storm-ravaged areas and swindle hard working Texans, who are already in the middle of dealing with a great personal tragedy." 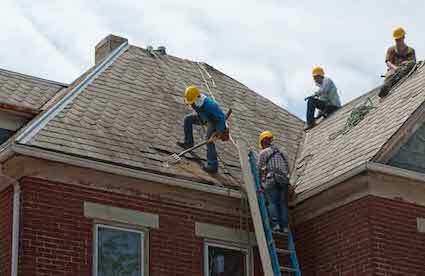 “Fraudulent roofers often look like the real thing and the lack of licensing requirements make it more difficult for residents to verify a roofer’s credibility or track them down and hold them accountable after a potential failure to deliver agreed-upon services,” said Sarah Burns, the Executive Director of RCAT. In the absence of state action, the association pointed to these steps  homeowners can take to avoid being ripped off. Those steps include calling your insurance company to fully understand what damage is covered and getting at least three estimates in writing. Also, don't be shy about asking contractors for references. Quality contractors are not going to have a problem providing that information. More information about the association's initiative is here .